White Chocolate Blueberry Lasagna is perfect summer dessert recipe- light, easy and no oven required!!! 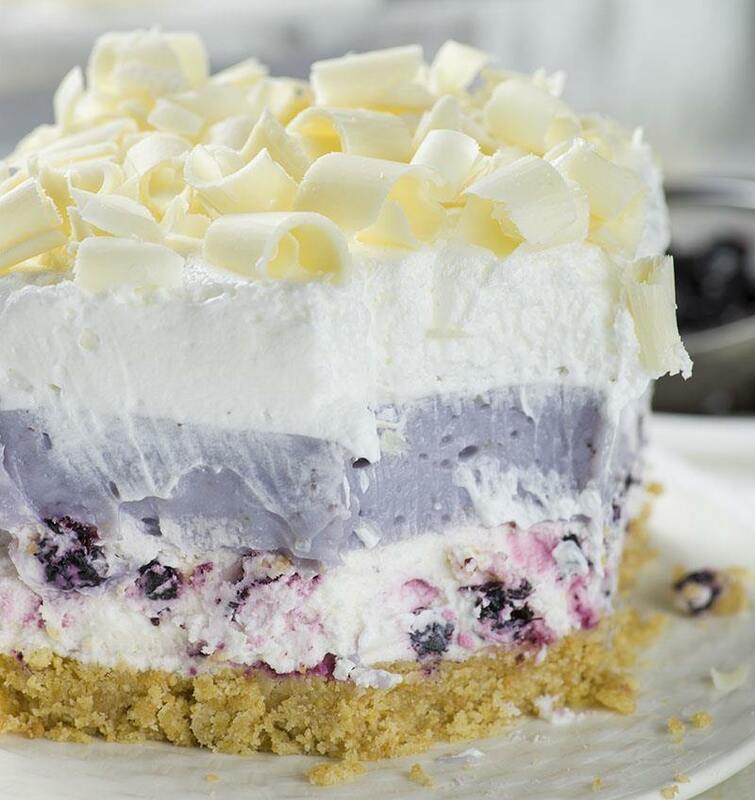 It starts with Golden Oreo crust and just keeps getting more delicious with every layer- cream cheese, blueberries, white chocolate and blueberry pudding, cool whip and a generous layer of white chocolate curls on top! Everything’s just better with chocolate, right?! It’s the middle of May and I’m already all into summer recipe ideas. 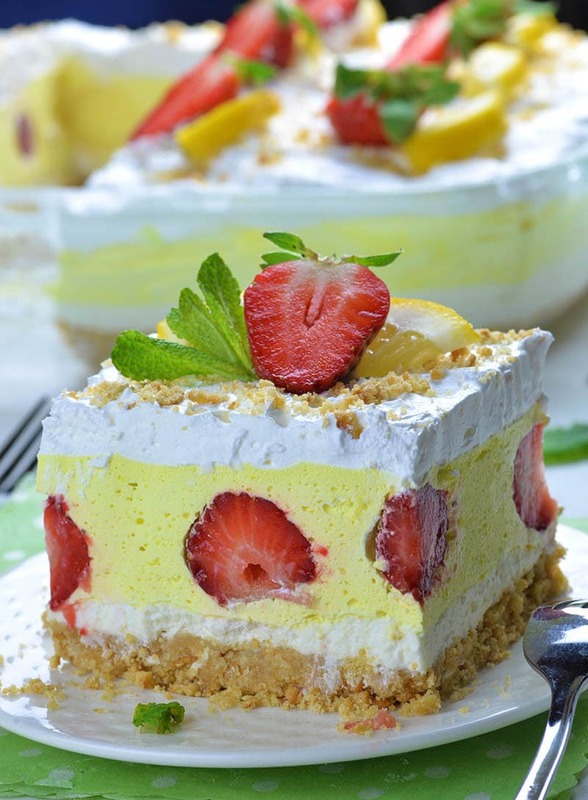 And summer simply means SIMPLE, REFRESHING, NO BAKE DESSERT RECIPE!!! I have whole collection of lasagna dessert recipes on my blog. My Lasagna obsession started with Chocolate Lasagna, than I made Pumpkin Lasagna and Key Lime Pie Lasagna. I thought, “I had to make it into a blueberry version” and that’s exactly what I did. That’s how my White Chocolate Blueberry Lasagna was born. And it is quite amazing, too. So let me introduce you to this tasty treat. First layer of this Blueberry White Chocolate Lasagna is mixture of crushed Golden Oreo cookies (check out this recipe for another recipe with this ingredient!) and melted butter pressed into bottom of the pan. It’s amazing no-bake crust and perfect base for every mouthwatering dessert. It’s followed by yummy cream cheese, butter and cool whip mixture boosted with blueberries. I had to use frozen blueberries because fresh is still not in season, but I think it would be great with fresh berries. At first I thought to use vanilla flavor for pudding layer, but I decided to go with white chocolate instead , because like I said, everything is better with chocolate!!! I added pulverized freeze dried blueberries into pudding mix to get beautiful purple color and enhance blueberry flavor in my lasagna. On top is just a simple layer of cool whip, but to make this easy summer dessert a little bit fancy and suitable to show off at any party, I shaved whole block of white chocolate and cover my Blueberry Lasagna with a bunch of crunchy chocolate curls. If you do not have time or patience to make the chocolate curls you can use white chocolate chips instead. It will work just fine as well. 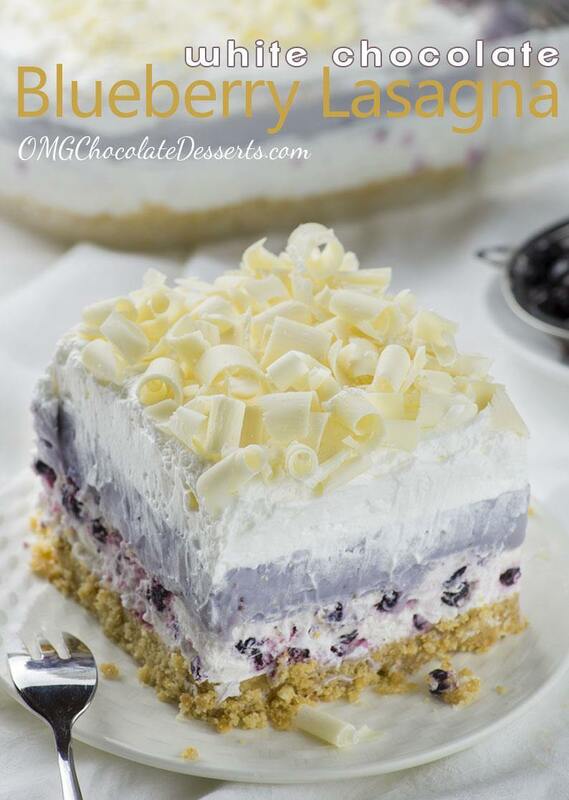 This layered, no bake dessert which I called White Chocolate Blueberry Lasagna is so delicious. I think you’ll really like it… especially if you like white chocolate and blueberries! These would be the perfect dessert recipe to try especially when fresh blueberries arrive! 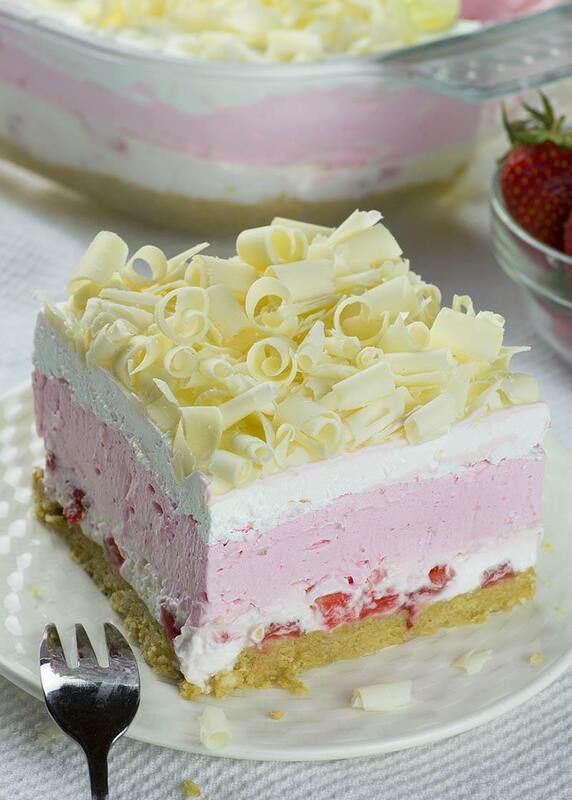 No Bake Strawberry Jello Lasagna – delicious layered dessert is a twist on classic Strawberry Jello Pie. No Bake Summer Berry Lasagna is EASY SUMMER DESSERT RECIPE for refreshing sweet treat. 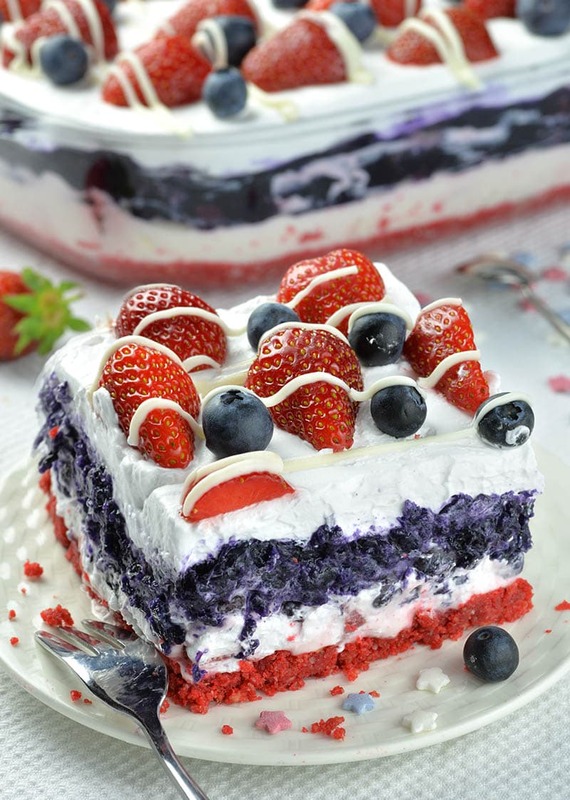 RED WHITE and BLUE no bake dessert is fun idea for Memorial Day and 4th of July. Strawberry Lemonade Lasagna is quick and easy NO BAKE dessert recipe with only few ingredients for light and refreshing spring or summer treat!!! White Chocolate Blueberry Lasagna is perfect summer dessert recipe- light, easy and no oven required!!! In a food processor ground whole Oreo cookies with the filling to get fine crumbs. Combine Oreo crumbs with 6 tablespoons melted butter and stir until evenly moistened. Press the mixture into the bottom of 9 x 13 inch dish. Set in the fridge to firm while making the filling. In a bowl mix together cream cheese, ½ cup softened butter and powdered sugar and beat well. Mix in 1 ¼ cup Cool Whip. Fold in blueberries. NOTES: If you use frozen blueberries you must thaw them first and rinse with water if you don’t want to get dark purple color for your filling than drained them well at several layer of paper towel!!! In a medium bowl combine white chocolate instant pudding with 3 cups cold milk. Whisk for a few minutes until the pudding starts to thicken and mix in pulverized freeze dried blueberries. Spread over cream cheese layer. Set in the fridge to firm. Spread 1 ½ cups Cool Whip on top. Top with white chocolate curls or shavings or sprinkle white chocolate chips. Refrigerate at least 3-4 hours before serving. I’m not exactly sure how to make the freeze dry blueberry powder. How is this done? Hi Angela, place freeze dry blueberries in food processor and run until they are pulverized into powder. Is that just blueberries put in the freezer and when they are hard, pulverize them in the food processor? No, but you could try that,it might work too. I bought dried blueberries and when I put them in my food processor it turned into a ball of tar-like substance, not even close to powder!!! I’m guessing dried blueberries and freeze dried blueberries are row totally different things!!! I could not find anything called “freeze dried” blueberries!! Any suggestions? Hi Lisa, freeze dried blueberries are totally different. If you can’t find them, try to pulse regular freeze blueberries(not thawed) with a Tbsp. of milk in a food processor. You could take blueberries that are frozen dethaw then put in a food dehydater. Old post is old, I know. But freeze drying is a low temperature dehydration process which involves freezing the product, lowering pressure, then removing the ice by sublimation. Sublimation is the transition of a substance directly from the solid to the gas phase, without passing through the intermediate liquid phase. You’d have to buy a freeze dryer or buy it online. Would probably be by the dried fruits. I KNOW RIGHT!!! My friends mom is from Italy, and she made this for my birthday party. She said it is an old Italian recipe. Looks fabulous going to make it red, white and blue with strawberries for top garnish! Thanks Joanne, it will perfect festive dessert. This seems like such a great idea! What size pan did you use ? Hi Emily, I used 9 x 13 inch Pyrex pan. Could you replace cool whip with real whipped cream, hate the chemical taste of cool whip! This looks incredibly delicious (almost obscene! ), and I plan to make it with my little girl for her dad’s upcoming birthday. I have never curled chocolate, so I’m wondering how to do it. Also, what do you recommend for the white chocolate bar? I can’t say I’ve ever seen one at the supermarket…then again, I’ve never sought one out. Any tips would be much appreciated. Thank you! Hi Jenn, you’ll find white chocolate bar at the market. Use a potato peeler, grater or very thin and sharp knife and just keep scraping alongside the bar. Do you have to put the freeze dried blueberries in it? Not sure what they are or where to get them. You could get Trader Joe’s freeze dried blueberries on Amazon.You don’t have to use them,but than you won’t have purple colored pudding with blueberry flavor, just go with plain white chocolate pudding instead. Or you could try to pulverized frozen blueberries. Hi Sharon, powdered sugar is the same as icing sugar. Cool whipped is stabilized whipped cream, and the instant pudding is the type of pudding that doesent need to be cooked, it’s just mixed with milk and thickened, it thickens without the cooking. Hope that helps. I’m not fond of blueberries, so I was thinking strawberries. Do you think that’ll work? II’m thinking about using real whip instead of cool whip . I almost passed out when I saw this photo and the name of this dessert!!! I gotta make me some white chocolate blueberry lasagna! I just hope that my wife and kids do not like it so that I can eat it ALL! Thanks for such a creation! Looks amazing but what is cool whip? And white chocolate pudding? Not sure we have in UK! Hi Chloe,you can substitute cool whip with stabilized whipped cream and I’m not sure what could you substitute for instant white chocolate pudding.Instant pudding thickened without cooking. I have a friend in the UK and when I sent her recipes I began looking on line to help her find substitutes for jello pudding…This was back in 2011..hope these guys still supply! Good luck! I am going to make this in place of a bridal shower cake for my daughter’s shower. I know she will love it. Put my dried blueberries into the food processor and it turned into a thick paste instead of a powder. What did I do wrong? Are you sure you used ‘freeze-dried’ blueberries? Freeze dried berries have had all the water removed during the drying process at the factory. Thus they are small hard and very light. A whole bag weighs almost nothing. I find them at Trader Joes as well as my local grocery in the dried fruit section. They should not have the ability to turn to a paste. Hope this helps. Is this a dessert that could be made a few days ahead and frozen? Or is it one that is intended to be made and eaten in the same day? Hi Elizabeth, you can use homemade stabilized whipped cream(beat heavy whipping cream with powdered sugar and add some gelatin). I too hate cool whip but you can stabilize real whipped cream with this recipe. I believe that you are a fraud and there is nothing about this recipe that is chocolate! You have to live on another planet. First of all there is no such thing as freeze dried blue berries that you can pulverize into powder only dried berries that turns into thick gunk, oh wait my husband just found a pound of blueberry powder for 37 bucks on-line. I’m going to buy that for 2 ounces. Not! Second there is no such thing as white chocolate pudding and I went to 3 well known grocery stores to try to find it and they don’t even sell it. Third the pudding never thickened. Fourth this is not a recipe for a 9×13 pan that pan is way to big. Fifth you can’t get real chocolate in white chips or bar hence not one thing in this recipe would constitute you calling it white chocolate blueberry lasagna. Wow, calling someone a fraud because your grocery stores do not carry the ingredients or you never heard of the ingredients is really immature and ignorant on your part. It is her recipe and if you can not find the ingredients do not take it out on the person that created the recipe. Read the reviews where to find the ingredients, buy them, or MOVE ON. ? Well aren’t you just miss sunshine on a stick. 1) There is such a thing as freeze dried blueberries. Perhaps you don’t have the correct one. Obviously the author did because she made it. 2) There is absolutely white chocolate pudding. My local mom and pop store sells it along with Wal-Mart, Target, and even Aldi’s. Not sure where you shop. It’s made by Jello brand. 3) The OP made it in a 9×13. Not sure what you did wrong. 4) White chocolate is white chocolate. She never said it’s a dark chocolate blueberry lasagna. It’s called white chocolate blueberry lasagna. Everyone knows white chocolate isn’t real chocolate but she never claimed it’s anything else. Seriously, get a grip lady. Jello makes White Chocolate Instant Pudding. Freeze Dried Blueberries at Walmart. You can find White Chocolate Bars from Ghirardelli’s to Bakers Delight. Do your research before opening your mouth and making yourself look stupid. Since my husband and son don’t like blueberries I substituted strawberries. It came out great! Can you use fresh or frozen blueberries instead of freeze dried???? Can you use any type of fruit ? Can you use fruit in a can ? Can you make this a day in advance or will the crust get too mushy? You can store it in the fridge for couple of days. Hi i need help I don’t have pudding mix in Ireland what can I do ? Sorry Seamus, I don’t have any idea. Where is the best place to purchase freeze dried blueberrys? You could try at Trader Joe’s. 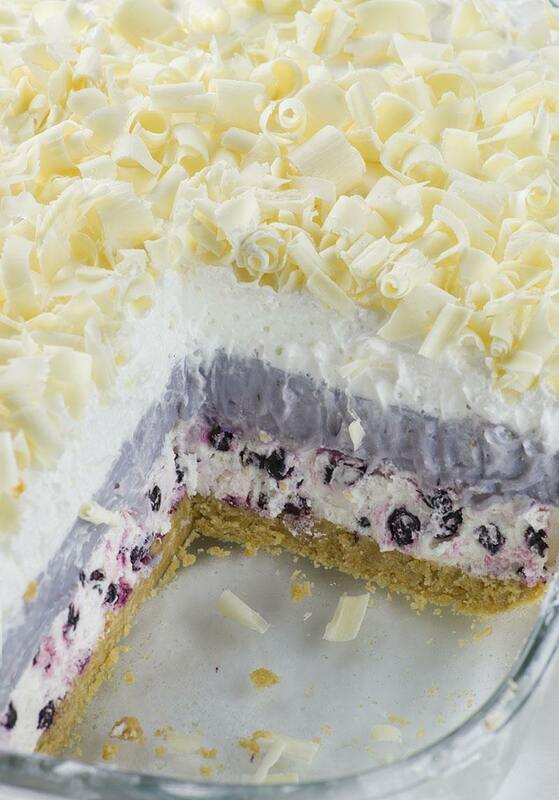 I love white chocolate, cream cheese and blueberry anything. OMG what a combination. This makes me dream that I wasn’t a diabetic. I just look at the pic and read the recipe and my sweet craving has been satisfied for the day. Where do you get freeze dried blueberries? Hi Cheryl, try at Walmart or Trader Joe’s. Where do you find freeze dried blueberries? Hi Jen, You can find them at Trader Joe’s. Made this to take for Thanksgiving – Hostess wasn’t sure if it should have been served with meal or dessert? Apparently the “Lasagna” denotes that it has pasta in it, at least to some people? This dish was GORGEOUS and tasted bakery-fresh! My only con was that my dried blueberries, for the pudding layer, never turned powdery and tasted a little bitter? I couldn’t find “freeze-dried,” only dried … this may have been the difference? Yes, dried blueberries makes big different.They can’t be ground into powder. I’m so excited to make this!! Looks so good! Will it become soggy if I leave it overnight? Where do you get freezes dried blueberries? I wonder does this turn out a lavender color like in the pic? DO YOU HAVE ANY VEGAN RECIPES? GOING INTO AN ASSISTED LIVING FACILITY AND I WOULD LOVE SOME VEGAN RECIPES. Sorry Michele, I don’t have vegan recipes. I just wanted to let you know that I have made this recipe at least 10 times over the last year for different occasions and it is always a HIT! I followed your recipe EXACTLY and it turns out EXACTLY like the picture you posted. People always ask me about this dessert and request for me to make it again and again. Just wanted to say thanks! OMG! So delicious and decadent! This is killer! Making this for husband’s first pot luck at his new job. Hope it goes over well, my reputation is on the line! Has anyone tried pulsing frozen blueberries into the pudding layer? I’m wondering how that turned out as I haven’t been able to find freeze dried blueberry on short notice in Canada. Thx! I made the pudding with 2C. milk and reserved the third until after I added the blueberries. I washed and dried fresh blueberries, quickly pulsed them in the magic bullet and whipped them into the pudding. I slowly added enough of the reserved 1C. Of milk until the pudding was still stiff but smooth ( maybe 2/3C. ). It turned out perfect and blue! A slightly more natural blue/gray. But still amazing! I made this for my Dads birthday and he absolutely loved it! Thank you for sharing! I tried this recipe but the pudding layer did not thicken. The pudding layer was a soupy mess. I know I used instant white chocolate pudding. Any idea why my dessert didn’t turn out correctly? The dessert still tasted amazing anyways. Sorry to hear that, I don’t know what happened! My family loved it. Target has the freeze dried berries. Will be making it again. Thanks for sharing. I can’t find the actual recipe anywhere on this page. Someone help. I found it a day or two ago and now have no clue where it went. Thanks!